Known as “Huo Guo” which can literally be translated to fire pot, Chinese hot pot has a long history of over a thousand years and is believed to have first originated in Mongolia where horse meat, mutton or beef were used as the key ingredients in stews. 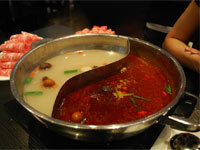 Hot pot was first introduced into Southern China during the Tang dynasty (618 -907 A.D). Later, during the Yuan dynasty under the Mongolian rulership, hot pot was further popularized. By the time of Qing dynasty, the last dynasty in China (1644 to 1912 A.D), hot pot has become popular all throughout China and various regional differences in styles have developed. Today hot pots are popular all across China and in East and Southeast Asia. 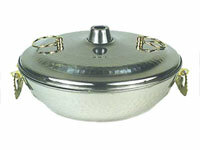 As described by its name, hot pot cooking involves a large metal pot containing a base soup, often made from stock or with other ingredients to provide the base flavor for the cooking of fresh ingredients. This large pot is typically placed in the middle of the table around which people will sit and cook fresh slices of raw meat, seafood or vegetable items using the boiling hot soup base. Because this method of cooking produces a lot of steam and heat, it is also sometimes known as steam-boating and is popular during the cold winter and early months of spring. Seen as a participatory cooking and eating activity, hot pot has also become increasingly popular over the years during Chinese New Year and festivities for friends and family to gather around a large pot in share in communal cooking and interaction. Given its long history and its spread across China, hot pot cooking has developed distinct regional variations and styles. The most famous and popular hot pot regional style is the ‘Chongqing” hot pot style, sometimes also known as “Chungking” hot pot, or “Ma-la” hot pot, which can be translated to mean “numb” and “spicy” referring to the soup base which is so spicy, it sometimes produces a burning and numbing effect on the tongue. To create this flavorful and spicy soup base in which ingredients are cooked, Sichuan pepper is added. The broth is a deep red from the pepper, and various kinds of raw meat, seafood, and vegetable items are cooked in this boiling broth. In Northern China, the Northern style hot pot can be commonly found in many Northern cities like Beijing and Shanghai. The Northern style does not focus as much on the soup base, but more on the act of cooking using boiling hot pots. Commonly referred to as “Shuan Yang Rou” which means “instant boiled lamb”. Meat slices are cooked in boiling water and paired with condiments and sauces for flavor. Manchurian hot pot uses a pickled Chinese vegetable, “Suan Cai” which literally means sour vegetable, for flavoring. As a result, a sour stew is created for this type of hot pot cooking. Cantonese hot pots are popular in Southern China and in Hong Kong, and focus heavily on the soup bases of hot pot. Often a variety of soup base options are offered at hot pot restaurants, ranging from herbal broth to basic meat stock broth. Because it is believed that hot pots are “heaty”, complementing Chinese herbs that are believed to balance the “fire” and “heat” of hotpots are employed in soup bases. Examples include cilantro and century egg soup base in Cantonese hot pots that are believed to lower the “heat” of hot pot dishes. 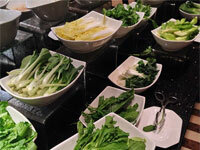 Cantonese hot pots stress variety and freshness of ingredients. 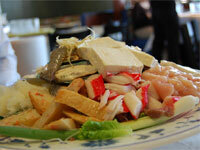 A variety of seafood, meat and vegetable items are usually paired with this style of hot pot cooking. In Hong Kong in recent years, a combination cooking style of hot pot with clay pot cooking is also becoming popular where restaurants first serve a clay pot dish, after the initial enjoyment of the clay pot dish, broth is added to the clay pot and hot pot ingredients are cooked using the hot pot style cooking. A wide variety of ingredients are used in hot pot cooking. Meat used in hot pot cooking is generally sliced very thinly so that the meat can be cooked thoroughly in a short time to keep them tender. Meat choices often include beef, pork, lamb, goat, and chicken. Fatty slices of beef are preferred to lean meat, as the fatty meat slices cook well and remain tender and juicy. Seafood items can include prawns, scallops, fish, cockle, clams, mussels, lobsters, crabs, squid, and oysters. Often times, fish paste is also used in hot pot. Small scoops of fresh fish paste are cooked in the boiling broth. Fish balls, prawn balls and cuttle-fish balls are all popular items in hot pot cooking. Some modern versions of fish or prawn balls also contain filling such as shrimp roes or fish roes. Vegetable items can include a wide variety of mushrooms and greens. Enoki, shitake, and straw mushrooms are widely used. Vegetable items can include lettuce, napa cabbage, spinach, Bok Choy, Choy Sum, carrots, tomatoes and corn. Today, hot pot cooking can be done at home with portable electric heat pads or with portable propane hot pot burners. Many families purchase these portable burners, and equipped with large pots of their own, can craft their own broth and cook away with fresh ingredients of their choice. Portable electric hot pot heat pads or burners are easy found online. Pots for hot pot cooking should be wide enough for a few to share in cooking and also deep enough for the soup base to boil comfortably without spilling over. Pots, however, should not be too deep as it would get in the way of retrieving cooked items. 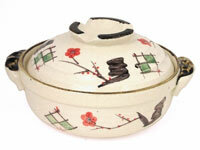 Ideal pots should have a wide rim and a moderately deep body. Hot pot cooking is often enjoyed at family gatherings or during festivities because it requires little in the way of preparation, and can be a healthy meal. The participatory aspect of hot pot cooking also makes it especially enjoyable for the whole family. It is a common sight to see large families gathering around a hot pot or two exchanging laughs and good food. It is a great way to stay warm in the company of loved ones while enjoying a tasty and healthy meal. Easy to prepare and to customize to your own distinct style and liking, hot pot cooking is an excellent way for the whole family to partake in the joy of one another’s company not only with the end product—the food dishes, but also to enjoy the process of cooking together.